Why Support the Siberian Lutheran Mission Society? Lutheranism is not new in Russia. The religion came to Russia just after the Reformation. The first church building in Moscow was dedicated in 1576. From this time the Lutheran Church in Russia steadily grew. At the invitation of Tsarina, Catherine II, many Germans came to Russia to establish farms, businesses, and communities. The Reformation spread through the German communities of the Baltic nations and to Finland. These nations were absorbed into the Russian Empire as it expanded. By the time of the Boshevik Revolution, the Lutheran Church was the second largest church denomination after the Russian Orthodox Church. Parishes stretched from St. Petersburg, along the Volga River, in the Caucasus region of the Black Sea, and on to Siberia where daughter colonies of German-Russian Lutherans sprang up as part of a quest for new land. All this abruptly changed with the coming of Lenin and the 1917 Russian Revolution. Under Stalin, all of Russian Christianity suffered. Stalin ruthlessly persecuted these immigrant communities. Within a few years, all church buildings had been confiscated and destroyed or converted to theaters, nightclubs, community centers, indoor swimming pools or barns. By the early 1930’s all Lutheran pastors had been exiled to gulags in Siberia, never to return. Very few survived the imprisonment and many may have been sentenced to death at their trials. We will never know the horrific details. As a result, millions of Lutherans in Russia were without pastoral care for many decades. Lutherans in communist Russia lived in terrible fear. Bibles and hymnals were burned, but those who were faithful wrote out hymnbooks and scripture based on their memories. What a great testament to the value of confirmation classes and liturgical services and hymns that teach scripture. In 1941, Lutherans were employees of collective farms and agricultural enterprises. Once the communist government fell, many of these Lutherans returned to their ancestral homeland in Germany. Others remained in Siberia and those individuals, along with Russians who had undertaken the study of Lutheranism, formed the nucleus of the infant Siberian Evangelical Lutheran Church. During the early 1990’s, Rev. Dr. Wallace Schulz, then 2nd vice president of the LCMS, organized a series of theological seminars on the campuses of Fort Wayne and St. Louis seminaries. Among the more than 200 visitors from the nations of the former Soviet Union were Pastor Vsevolod Lytkin and several young members of what became the Siberian Evangelical Lutheran Church; including Rev. 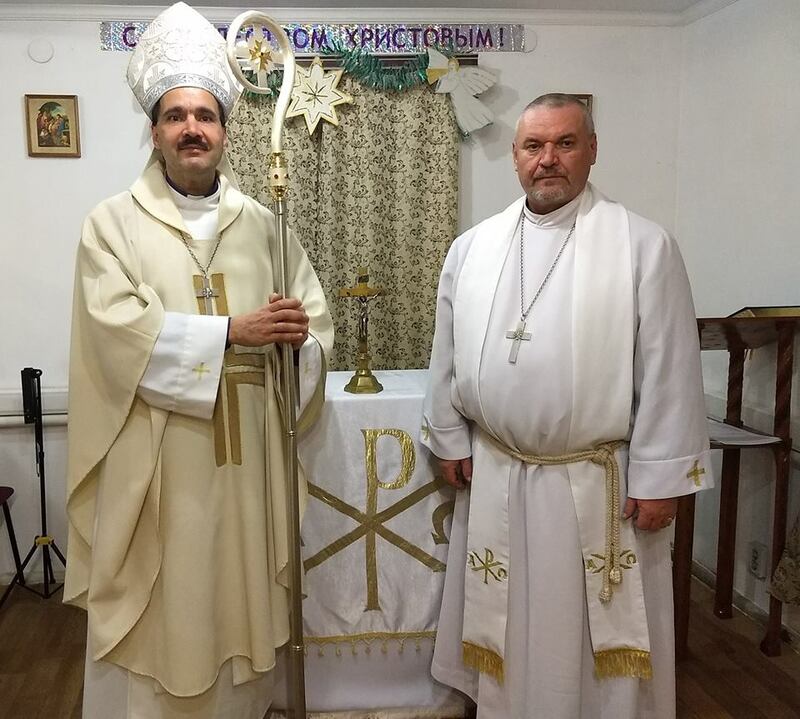 Alexey Streltsov, who is currently the Rector (President) of Lutheran Theological Seminary in Novosibirsk, as well as other young men who have become pastors and church leaders throughout Russia and other former Soviet countries. 1n 1995 Pastor Lytkin asked Dr. Schulz for help in training pastors and deacons in Siberia. The Russian Project was established on the campus of Concordia Theological Seminary in Fort Wayne in answer to Dr. Schulz’s appeal. The Marvin M. Schwan Charitable Foundation graciously agreed to fund the Russian Project. Rev. Dr. Timothy C. J. Quill was called to direct the project. Since 1996, the Russian Project has trained nearly 40 men for the ministry. The majority is now serving as pastors in Russia as well as in Kazakhstan, Lithuania, and Latvia. One of the graduates has been named the Bishop for the German Lutheran Church in Ukraine. Several women also studied at CTSFW and now serve as translators, deaconess, and church musician. Lutheran Theological Seminary was soon established in Novosibirsk, central Siberia, to train Russian men for the ministry. LTS is the only residential five-year full-time seminary in all of Russia. There are currently 22 trained pastors, several deacons with two new deacons added in 2018 who serve 28 congregations including preaching stations, which are the beginning steps toward forming congregations. One of the new deacons will serve at-large, traveling to remote preaching stations. The second deacon will begin serving in the city of Tomsk while the pastor is serving in Yaffo, the old district of Tel-Aviv, Israel. The project in Tel-Aviv is conducted, together with confessional Norwegian Lutherans, to reach Russian-speaking Jews. Rev. Pavel Zayakin, one of the original pastors of SELC, has now been deployed to Ukraine as a missionary to assist in the planting of churches in that former Soviet controlled country. In the mid 1990’s, Rev. Zayakin was much like the American historical circuit riders for the LCMS. He carried potatoes to homes and introduced the Scriptures to many residents hundreds of miles east of Novosibirsk. At one point, Rev. Zayakin was jailed for spreading God’s Word. The challenges in spreading the Gospel in Siberia are great. Decades of atheism have numbed the minds of many to the concept of God’s ever-present love. Others have been exposed to missionaries who have taught the doctrine of the law without the all-important understanding of the preeminent role of God’s grace in man’s salvation. An undeniable reality is that Siberia is a land fraught with the teachings of Paganism, Shamism, and Buddhism. Russia’s inflation rate is currently at about 4%. However, VAT tax is up to 20% (from 18%) as of January 2019, so it is likely inflation will grow. Right now the price of gas in Siberia is $2.50 per gallon so oil reserves in Russia do not translate into lower prices for the public. There is a huge divide between the rich and poor. Currently the unemployment rate is 4.9%. Salaries in provincial/rural areas are just above minimum level. The so-called “depressed” regions would be a totally different story. Our church (SELC) has a number of parishes in such economically impoverished areas. There is also a large difference in salaries depending on people’s occupations and the regions where they live. Moscow and the wealthy regions of the north (with oil and gas reserves), for example Sakhalin region live quite well. Officially there are 20 million Russians living below the poverty line which ranges from $120-$160 per person per month depending on the category of the population (retired, children, and working population). Unofficially the experts give the figure of 35% of the population live below the poverty level. According to sociological tests, 80% of Russians consider themselves “poor.” Disease is an additional problem, with tuberculosis (TB) rearing its ugly head due to improper nutrition in many of the poorer communities. The Siberian Lutheran Mission society organized in 2002 to support the work of the Siberian pastors and the needs of their congregations by providing financial support with is designated for congregations, rental of church buildings, housing costs, travel, humanitarian aid and mission outreach programs. We also respond to emergency needs and provide opportunities for teaching and preaching for LCMS pastors who wish to teach in Siberia. SLMS and the congregations of the LCMS have supported a number of special projects.